While we were in Raleigh, I noticed all these amazing works of Cows...what I mean is that driving around town, there were Cows randomly placed as works of Arts throughout the town in the Triangle Area. The CowParade, the world’s largest and premier public art exhibit, features more than 80 painted, costumed and festooned cows, all whimsically transformed by regional artists, professional and amateur, from life-sized “blank canvas” fiberglass cows. Each cow is decorated by a local or regional artist and is sponsored by a company. The cows are on display from August to December and will be auctioned off in February all to benefit the North Carolina Children’s Hospital. 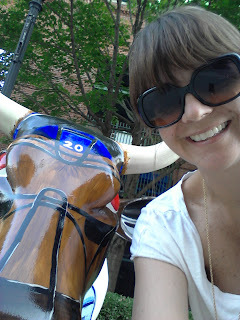 Past events of Cow Parade have been in New York, Brazil, France and more listed here. The life-sized bovines are about 8’ long and 5’ high and weigh approximately 125 pounds before application by the artist. 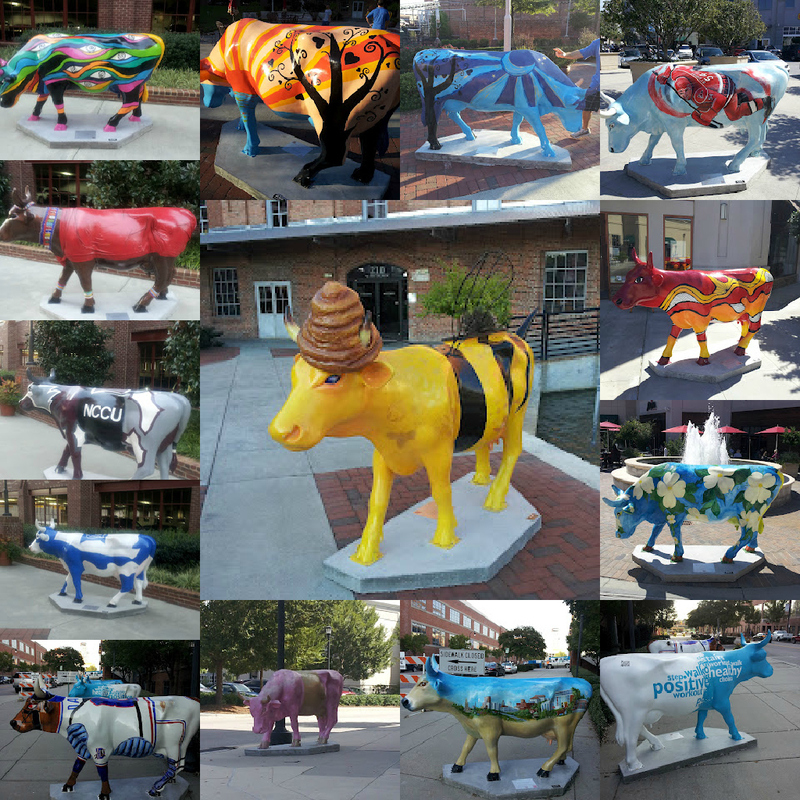 Cows are displayed throughout the Triangle, in streets, parks, storefronts and other public places,becoming a free outdoor museum of cows. When installed in their exhibit locations, each finished cow will be attached to a 400-pound concrete base so noone will moooove them. Find out more information on this Moovement by visiting their website and Facebook.They even have an app! What an amazing way to raise funds and beautify the town. They were really easy to find and gave our day a little extra excitement. My favorite was the Burt Bees which was right outside their headquarters which was exciting in itself, I almost busted down their tours begging for a tour!.